Thus far, it's been a strange, topsy-turvey, stop-start sort of spring. A relatively mild February ended in the grip of raw, bitter cold, and a country transformed - and transfixed - by snow. By the end of the first week of March, though, temperatures began to pick up, and slowly climbed to something resembling normal. Last Friday we basked in strong, wintry sunshine, and people sat outdoors drinking tea; on Saturday we awoke to snow and a penetrating, icy cold. A few days later, and the vernal equinox - officially the first day of spring - was filled with the sort of sunshine which makes the day feel infinitely warmer - as long as you walk on the sunny side of the road. It's still only March, still early spring, and so this is a sunshine which only warms where it lands. And throughout this time Lent has - as always - run away with itself. In the midst of my annual disbelief that it's already five weeks since Ash Wednesday, the shrouded statues of Passiontide remind me that Holy Week is just around the corner. As ever, I wonder what has happened to some of my Lenten plans and ideals: alas, the limoncello-making seems to have survived the best - though even with that, I haven't shaken it as often as I should have! This stop-start spring has certainly contained a stop-start Lent. Meanwhile, in snow and frost, sunshine, rain, dull days and bright alike, flowers have been blooming, there's a greening to trees, and a suddenness of pink-white blossom. 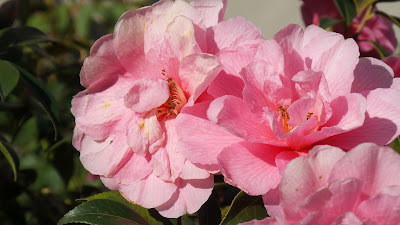 Some sheltered camellias in our road clearly sniffed the spring long before the rest of us, and were already in full bloom in February, flaunting their loveliness before the less flamboyant, more seasonal primroses and daffodils. Somehow, they managed to withstand the frost's scorching; since then, unperturbed, their buds have continued to open, their beauty unaffected by icy blasts. I was surprised when I first saw them, though I shouldn't have been, as I remember noticing them last year, flowering at the same time, and evoking the same response. But the surprise persists, as it does each time I first catch sight of the blossom. And really, that's part of the delight of spring: even though it's a recurrent part of earth's cycle, its annual advent heralded by snowdrops and daffodils and lengthening days, spring still manages to catch us unawares, astonishing us with its manifold gifts of new life. Long may I continue to be so delightedly surprised.